Viral Video Training, Free Viral Marketing Ebook & Amazing New Features! I’ve got some free video training, new Contest Burner features to announce and an ebook for you to download today. Before I get on to the goodies I need to remind you that the current $10,000 ContestBurner contest is wrapping up in less than two weeks so you’re running out of time to rack up your points! Below I’ve included your links to pick up some more bonus points. Now ContestBurner also works directly with a TON of new social sites and bookmark sharing sites like Digg, StumbleUpon, Squidoo, Myspace, Yahoo Buzz & dozens of others! 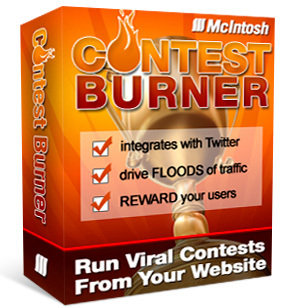 You can also just send any Tweet on Twitter & just use the @contestburner reply or use the contestburner.com domain in any link and you’ll get bonus points for every Tweet. Thanks for taking part in the contest. I am very eager to get this plug in to test it. I signed up and I am waiting for instructions.